It’s a big stretch to post this. It was a big stretch to write it and even more to read it in the writing circle at Esalen. And yet it was one of the first things that Ann said to me when we met individually that first week of my time there. While there are miles of more writing to be done on the topic, it’s time to bring it back out. It’s time to begin the process of writing about my mother. But she doesn’t realize how raw this grief still is inside of me, how fragile I am to think of her, how I still don’t let myself linger on memories of her illness for much longer than a few minutes. Me – the grief counselor, the hospice worker, the psychotherapist, the daughter – who is grieving and mourning in ways that make the words achingly impossible to form about who Sara was, what the ending of her life was like for me, what we were as mother and daughter together in our struggles and our more peaceful times. How in just writing these first innocuous sentences, the tears are already welling in my eyes, they are already clouding my vision as they drip down my cheeks. She doesn’t know this, the woman who wants me to write about my mother. My mother who died two years ago in two weeks, the woman who I said was the reason my writing couldn’t be seen or heard while she was still alive, the woman who’s been dead for almost two years and who I can no longer blame for my writing not seeing the light of day. That woman. My mother. I know better than anyone that there’s plenty for me to say and to write about her. But I’m just not so sure that I’m ready. Whatever it is that you’re not ready to write, to say, to share, to let be seen – go there. I took a whole series of pictures in the last months of her life and they sit here on the computer, in a folder I haven’t opened once in these two years. I can’t look at them. I can see photos of her from long ago, smiling, healthy, intact. No problem. And I can even talk about those times with real ease and delight. But I simply cannot yet enter into the time capsule of the three months I spent living in her two-bedroom apartment in the barren, run down and cement-filled cul-de-sac in which she lived in Santa Rosa, her porch the only oasis of green within the circle, filled with so many plants that she called it her ‘jungle,’ always with something new blooming and giving forth new life even as inappropriately as it seemed to do with her own life drawing to a quiet and final close. I can’t … until now, perhaps. Her apartment where she had lived for 20+ years was small, cramped with a lifetime of family collectibles, furniture and photos that more than filled the crowded space, but filled it not nearly so much as the tension that grew too thick to even walk through, what with me and my siblings converging back into the family system that we had intentionally and mutually avoided for decades, that tension punctuated by drunken arguments flying across the living room and silence so brittle that I thought the crystal candy dish that sat centered on the early American dark wood coffee table that my cousin Stephen had bought for her because he broke her prize one, might just spontaneously shatter. I sort of wish that it would have, so that something, anything, could have broken through that cloud of family discord made only all the worse once the extended family showed up and the expected performance of sibling harmony was never delivered, while I experienced – whether it was ‘true’ or not – the brunt of the blame for that. There I was in one moment, tucked away behind a closed door in the bedroom, talking and crying on the phone with my brother’s ex-wife, ex-communicated as she was from being present, a voice of sane and loving comfort as the strangers in the other room sat, holding back their feelings through stiff upper lips that had more interest in the taste of alcohol than tears. And me, the foundation of calm and competence, when all around me, the family crumbled in their own grief and fear of getting too close to witness the inevitable outcome. Me, the hospice worker, ordering the medications, managing the symptoms, instructing my sister about how we could best care for her – how to change the bed sheets with Sara still in the bed, how to administer the liquid morphine, how to transfer her from bed to commode, how to take care of all the minutiae of details – while we tried to take care of ourselves and each other as our mother lie dying in the middle of her living room. How could I be the daughter and the hospice worker all at once? How could I do what had to be done while at the same time feel into all there was to feel? Sadness and rage and impatience and exhaustion and plenty more. How could I cope with my ex-husband walking into the room, offering my sister the care and comfort that he simultaneously withheld so coldly from me, stuck as he was in resentment from a marriage that ended over a decade before? How could I cope with my eldest brother coming into the house, thanking my sister for all she was so remarkably doing while he completely and totally ignored me, walking by me as if I simply did not exist, like I was merely another piece of furniture in the room, his girlfriend doing the very same, with the added gall of disdainful eye contact as she walked by? How could I not rail at my other brother, unable/unwilling to arrive without my sister’s firm insistence and generous financial help, and then upon doing so, causing more family friction than was already here? How could I stay silent, keep the peace and focus on my dying mother as this circus of neurotic Neanderthals paraded before me? How could I keep harmony with my sister – herself overwhelmed and unglued at the mere thought of what was happening – when I was exhausted and couldn’t keep up with all that needed to be done? We had our disagreements, she and me, but we came through them and got to the knowing that had to be our solid ground – we simply would do what had to be done. Period. And we did. How could I be with the daily barrage of changes – from Sara falling and hitting her head on the wooden dresser in the middle of the night, to not being able to walk on her own anymore; to needing us to clean her when she couldn’t get out of bed any longer, to having to wear an adult diaper while we pretended it was just a bed pad to preserve some of her dignity. Each and every moment of every day, it seemed, she lost more and more of her ability to care for herself. But she didn’t lose her cognitive capacities. Which meant she knew, as we did, what was happening. But there was little time or space to feel into the truth of any of that. She didn’t want to talk about it – that was never her way – even as we sometimes sat crying next to her bed. She tried to comfort us one night – she saw that we were crying and called us over, each of us on either side of her, burying ourselves into her – but her weakness could hardly hold herself up any longer, let alone her two grieving daughters. In that moment, we both knew – maybe all three of us knew – that the roles were permanently and irrevocably reversing now – it was time for us to do all that we could to take care of her and that necessarily included letting her go. Taking care of us was no longer something she could manage, nor something we could ask her for. Now it was time for her to know that we were there and would do anything and everything we could for her as she journeyed toward her final home. With grace and grit and all the overwhelm that sometimes stood in the way, the daughters she raised took care of their mother as she left this world. Yes, I was the daughter. And I was also damn grateful to be able to call forth that hospice worker who knew a thing or two about this time of life. The practical details and the not-so-practical ones. Trusting that even in the sadness, there were also moments I could laugh and be grateful for the sweet tenderness and poignancy of her smile, her gentleness that appeared more softly than I ever remember it when she was well; and the knowing that being there was making all the difference. I just didn’t expect that accessing the sweetness of some of these memories would take so long after her death. I was determined that there would be no pain (but there was some); that there would be no suffering (but there was some of that, too), even though there was no symptom-relieving medication that could begin to address my own. At least she had pills to take! And take them she did, we saw to that and she readily complied. Although she moaned sometimes in ways that were excruciating to hear, ways that made me feel I was drowning in a sense of helplessness, even as I knew that some of the struggles along the journey out of this life could not be medicated away. When the medicine did bring her relief, I was grateful beyond measure that she found peace along the path as well. I could go only so far with her. I went as far as I could and that letting go was perhaps the most painful of all. And me – the youngest of the siblings, the one somehow chosen to be with her in her last moments of life, in the middle of that silent night, silent except for her labored breathing; that dark night of early morning – it was me who was there with her when the time had come. I held her hand, matched my breathing to hers, pet her golden tabby cat who having avoided her for weeks, was now, finally, closely cuddled beside her; and I began to sing to her. I sang Wonderful World / Over the Rainbow to her as her eyes, wide like saucers, saw something of the mystery I can know nothing of from where I sat, as she took her final breath, her spirit lifting toward a place I could accompany her no further, leaving me behind in the room’s hollow emptiness, on the chair that became instantly cold and hard beneath me as my elder sister and brother slept soundly in the other room. On her Bucket List, she said, was ice cream; so naturally, we made sure there was plenty of it in the house. 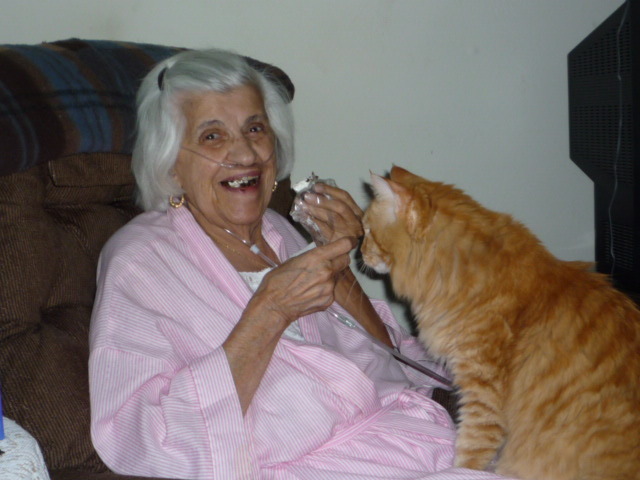 Here she is sharing it with her beloved kitty. 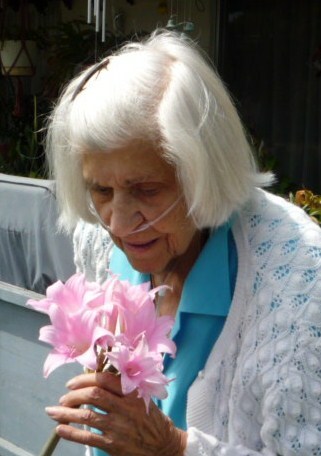 One of her last walks outside to see her beloved "naked ladies" in full bloom. Look at her hand - at 91, she still had the most beautiful hands. Okay, I’ve done it. I didn’t/still couldn’t look through all the photos in that folder. But I pulled these two out. And that’s a start.